Wedged in between Biblical epics like Barabbas and two Kings of Kings and the sweet Going My Way, with Bing Crosby as a singing priest, you'll find a different sort of Easter entertainment tomorrow on Turner Classic Movies. Easter Parade, which airs at 7 pm Central time, stars Fred Astaire, so of course I can't resist it, even if it isn't really prime Fred Astaire. Still, it is touted as Astaire's (and leading lady Judy Garland's) most profitable film, so there was something there that connected with audiences in 1948. The movie is set in 1912, when it was very popular for fashionable folk to stroll Fifth Avenue in fancy hats to to celebrate Easter. (It's still a thing, apparently, but it was at the height of its popularity earlier in the 20th century.) The stroll and the bonnets (and Irving Berlin's song which references them) are pretty much all the movie has to do with Easter, but that's not really important. In this one, Fred is a big song-and-dance star named Don Hewes, faced with a temperamental partner named Nadine, played by Ann Miller, who dumps him both romantically and professionally to embark on a solo career. Don decides to show Nadine that he can do just fine without her, plucking plain Hannah Brown (Judy Garland) out of a chorus to become his new partner. Hannah is very different from the glamorous Nadine; the struggle to find a way to mesh their styles and make the new act work (and fall in love) forms the basis of the rest of the plot. If I'm honest, I don't think Astaire and Garland are a very good match, and I especially dislike the number where they dress in ragged clothing and pretend to be bums. It's called "A Couple of Swells" and I always try to skip it if I can. But Fred's solo numbers -- "Drum Crazy" and "Steppin' Out with My Baby" -- are quite wonderful, as is the title tune. 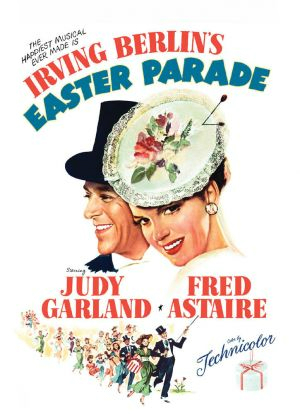 If you are looking for a tuneful, colorful way to relax on Easter night, Easter Parade may be just the ticket. It airs at 8 Eastern/7 Central tomorrow night on TCM.